GDPUK.com has been stunned to learn that the General Dental Council and the General Medical Council have been involved in secret talks to merge the two statutory bodies. A reliable government insider has told GDPUK that civil servants from the NHS and Whitehall have been mediating in the talks to establish a 'super council' which will carry out all regulatory functions with regard to doctors and dentists in the UK (excluding Northern Ireland). 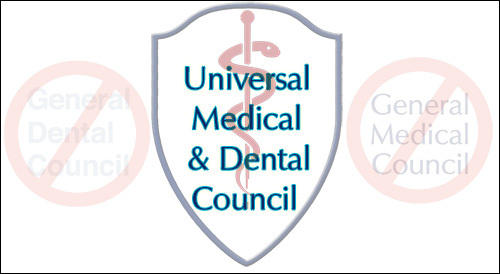 The proposal being discussed is that the GMC and GDC will be scrapped and the current functions administered by the organisations will be taken over by the Universal Medical and Dental Council. If the merger goes ahead, the dental profession and all related disciplinary matters in the UK, will effectively be administered by medical practitioners. The source of the leak said that the talks had resulted from long-standing disgruntlement in the medical profession regarding the UK dental profession's independence, but Britain's exit from the European Union next year had illuminated the opportunity for a change in the law regarding the dental profession's status. Until the Dentists Act 1928, the UK medical profession had governed and licenced dentists and it was only in the 1928 Act (enacted in 1931), that dentistry was given its independence. The Dentists Act 1984 – a revised act of parliament drafted to incorporate European Court of Human Rights requirements - was made law in 1987 and effectively extended the protection of dental independence in the UK. The triggering of Article 50 by Theresa May has necessitated the need for the Dentists Act to be modified or rewritten since a clause in the 1928 law means that on the ‘abandonment' of the Dentists Act, control of the dental profession will revert to ‘His Majesty's Grand Medical Council' (now the GMC). According to our source, the 1984 Act included a modernised clause which will similarly enable the GMC to take control of dental activities, should the UK leave the EU and European Court of Justice jurisdiction. The abandonment of EU laws will effectively dissolve the GDC on the 29th March 2019, Brexit deadline. The Whitehall insider said that talks are at ‘an advanced stage' and the Government is enthusiastic about the move. It hopes that the streamlining of the two statutory bodies will reduce costs and red tape. However, it is believed that a stumbling block in discussions is the constitution of the new regulatory body, with the board mainly being made up of medics and lay members. Only three dental members will be appointed and it is understood that dental disciplinary hearings will only be heard by medics and members of the public, although there will still be dental assessors looking at dental cases before being heard by a panel of (predominantly) medics. Another bone of contention is the question of the courtesy title "Doctor” for dentists, fought for by Douglas Pike in the early 1990's. Medical representatives involved in the current negotiations are reportedly adamant that the title be removed from use by dentists. Our source feels that the great enthusiasm of the GMC argument in negotiations is driven by the fact that the Annual Retention Fees (ARF) taken from dentists will greatly help in their own funding. It's our understanding that there will be no reduction in the ARF for dentists, despite the reduction in administration costs, resulting from caseworker redundancies. It's thought that the GDC's buildings in Wimpole Street and Baker Street will both be sold to Primark or Betfred. Representatives at the Department of Health, the GMC or the GDC have refused to answer questions directly on the revelations about UMAD, though they issued a statement last night, from Secretary of State for Health and Social Care, Mr Jeremy Hunt. A member of the British Dental Association Scientific Committee said: "What do medics know about the dangly thing at the back of the throat? Erm…..that's the uvula….right? Am I right?"